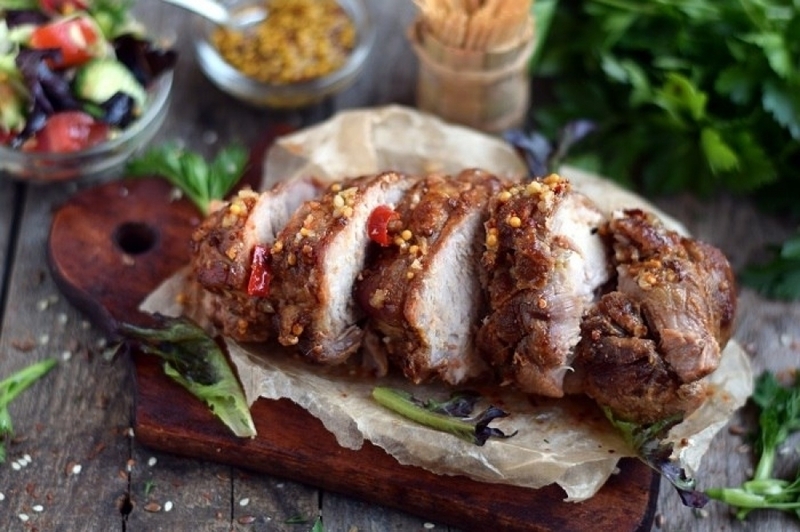 In this recipe we offer you to bake spicy pork tenderloin. 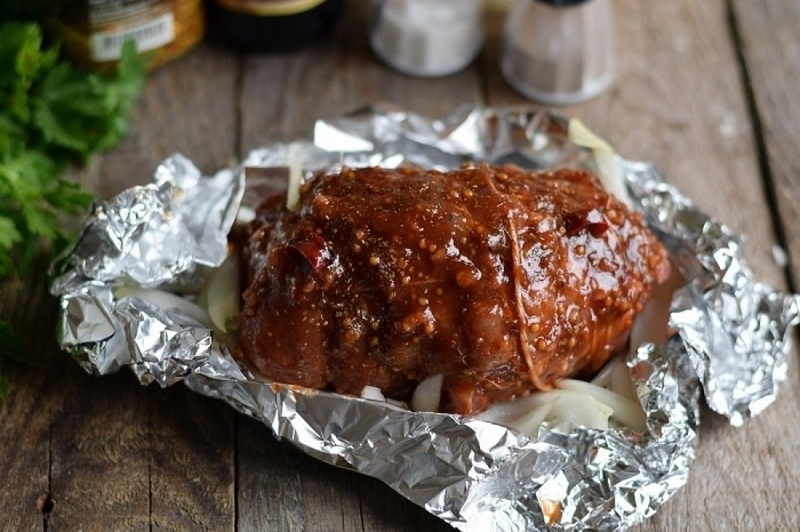 Pork is tightly bounded, stored for a long time in marinade, and then baked in foil, keeping all the juices inside. The meat turns out very soft, it has a beautiful crust, with a slightly sour taste due to pomegranate sauce and with a delicate aroma of garlic. It is better to expose part of the loin for the processing , that is a massive piece without bones and skin. Meat should have a nice pink color, thin layers of fat will melt during heat treatment and give it richness. 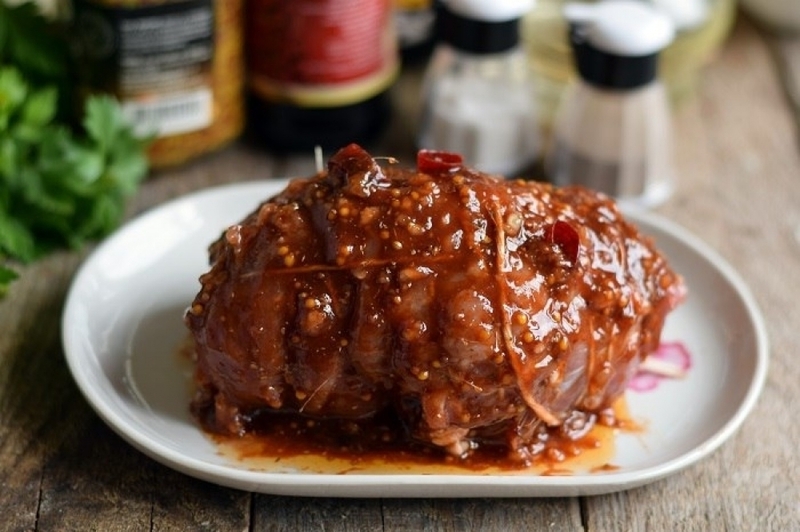 This meat appetizer will become a worthy decoration of a festive table. 1. 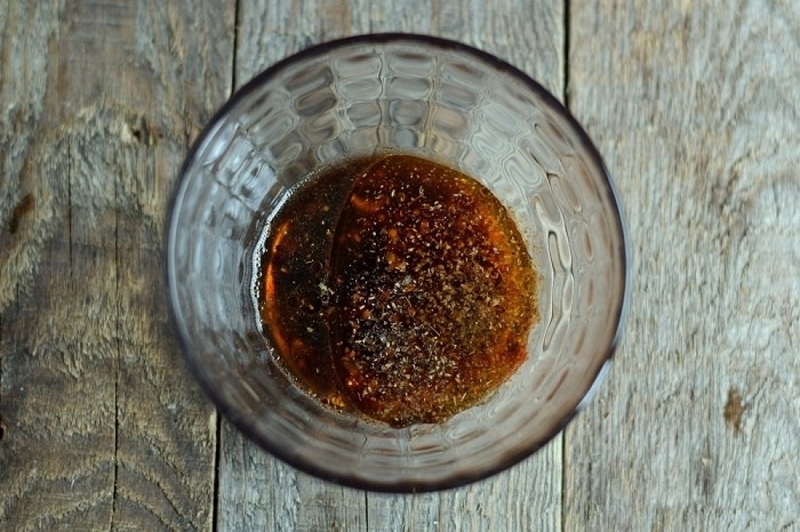 Pour the specified portion of oil and soy sauce in a deep bowl, add a set of spices. These spices will be enough, as the Adygei salt includes a large number of herbs and spices. 2. 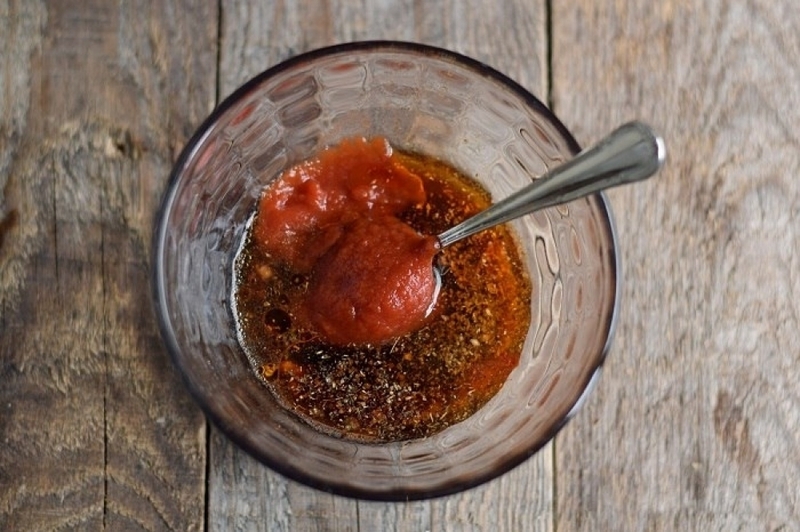 Continue by loading a spoon of tomato paste, stir intensively, dissolving it in a liquid base fully. 3. 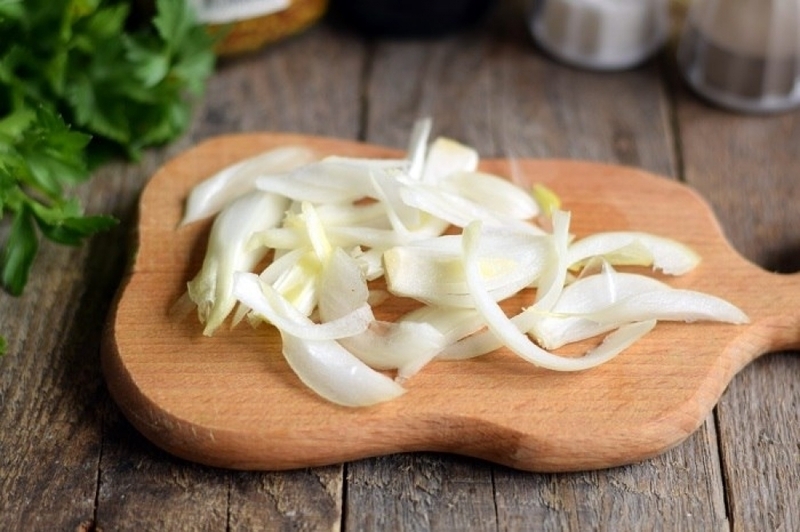 Remove foils from cloves of garlic, crush them in a special press, place to the marinade. 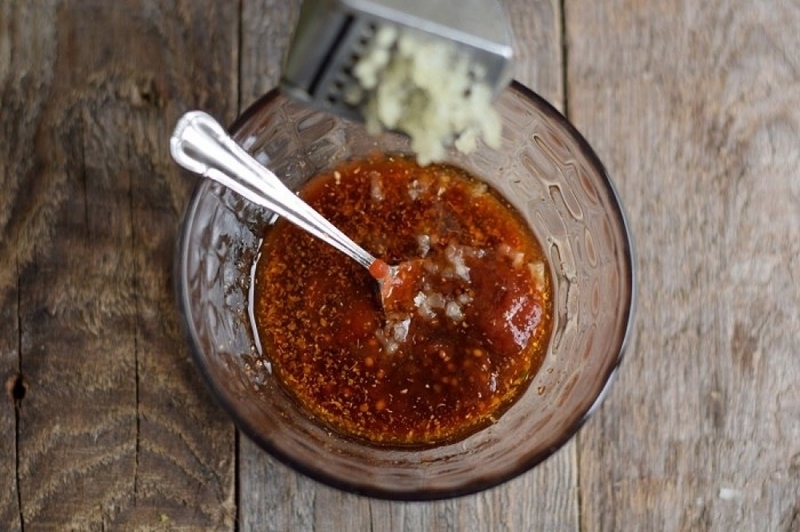 The garlic will give the sauce a unique piquant scent, and the desired spiciness. 4. 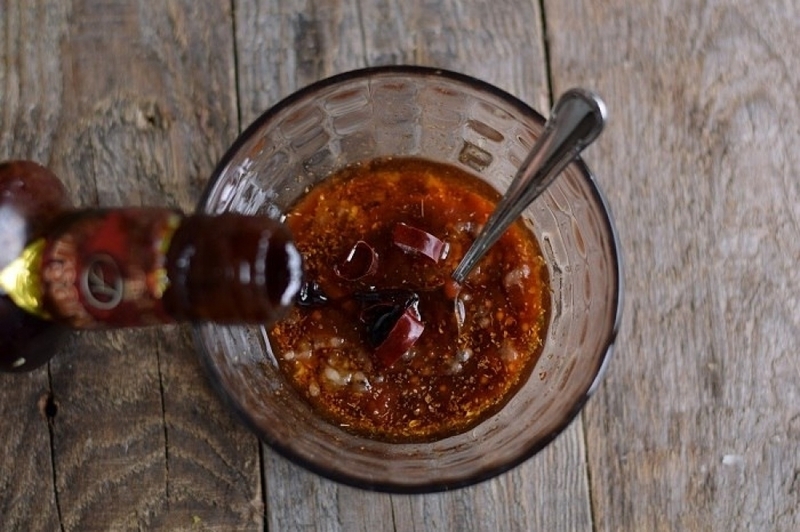 Then pour some concentrated pomegranate sauce in, throw rings of green hot chili pepper, again mix well, completely combining all of the components. 5. Thoroughly wash the meat, dry the moisture with a napkin, cut the excess fat off. Then wrap a piece with a thick thread (as shown in a picture). 6. 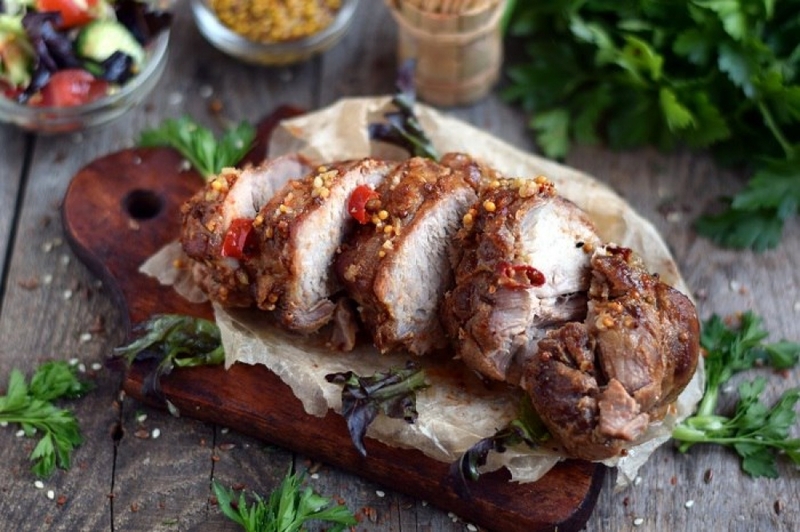 Coat a wrapped piece of meat with the spicy marinade on all sides. Leave meat to marinate In this state approximately for 8-12 hours in a cool place. 7. Towards the end of the marinating prepare the additional ingredients. Peel onions, cut them into half rings. 8. Place the meat on foil, lay the onions at the foot, seal the top with foil, leaving no gaps. Throw the package in a baking pan on the middle level of the oven, heat it up to 180 degrees. Place a container of water on the bottom level. Bake tenderloin in this pan for 2.5 hours, then remove water, open the foil, cook the meat for another 30 minutes. 9. Cut the prepared meat into portions.